Jeff Lloyd posted this photo of VUH378J from his collection (photographer unknown)so I just had to share it here! The bus is seen at St Budeaux Square heading back into Plymouth on the 72 from Looe. 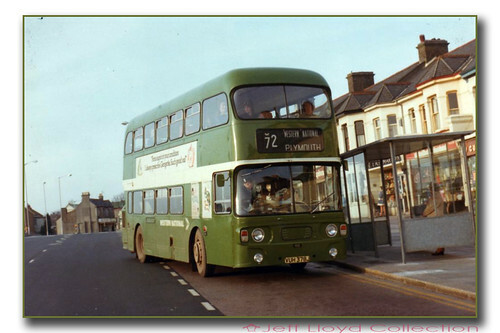 These buses were usually on the 72 and 76 routes so it was common to see them coming through St Budeaux. I often used to walk down to Bretonside to try and catch one of these home to St Budeaux from school in the City Centre when I was forming my interest in buses. I knew these buses were special compared with most other buses in Plymouth. I even knew they were Atlanteans, just like most of the Plymouth Corporation fleet, but somehow these were so much better. Light and airy and lots of blue plastic. Certainly a change from the standard Atlanteans Plymouth ran which always seemed very basic. My own local route was the 6 and 7 which was still very much a Lodekka route which were brilliant and much better than anything Plymouth ever ran - well in my eyes they were anyway. But even then the lure of 'new' buses was always a treat. I didnt like the Leyland Nationals that much, and Bristol VRs were rare on the 6 and 7s back then. Of course when the VRs did start to appear on the 6 and 7 then I lost interest in the Atlanteans - even these nice Alexander bodied ones. I was always a VR fan. Atlanteans were never really appreciated by myself until it was almost too late. Give me the chance to catch an Atlantean now and I will certainly take it (unless a VR is on offer at the same time!) The VUH-J batch were the exception and I really missed these when the were sent to Devon General to see out their last years of service.